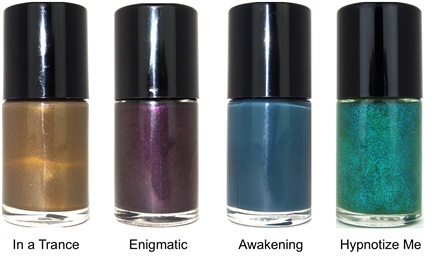 KellieGonzo: Cult Nails 'Hypnotic' Collection: Sneak Peek! 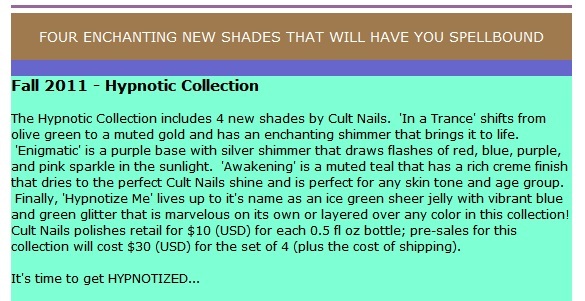 The Hypnotic collection is available for pre-sale until July 31 at http://shop.cultnails.com. I am way excited for these new colors from my girl Maria! She is a wizard at polish dreaming and I am just dying for In a Trance. I am not totally on board with Hypnotize Me, though it seems to be the most anticipated shade from most of the comments on her blog post where she swatches them for us as a preview (HERE). I get to meet Maria, the owner of Cult Nails, at CosmoProf North America in Las Vegas at the beginning of August and I am super stoked, she is such a sweetheart! Images provided by the manufacturer.